Central Water Commission’s Dam Register: How much do we know about our dams and rivers? Central Water Commission is India’s technical organisation under the Union Ministry of Water Resources. 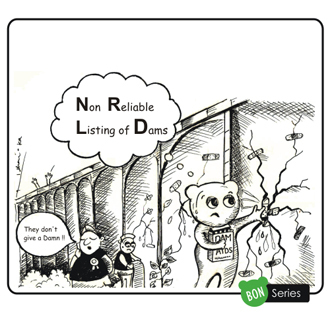 It publishes National Register of Large Dams (NRLD), the latest version can be seen at: http://www.cwc.nic.in/main/downloads/New%20NRLD.pdf. This is a key document that provides information about large dams in India. The latest NRLD seems to have been uploaded only this month, since for a number of states, it claims to have been updated till January 2013. The NRLD is certainly a useful document, the only list of large dams in India and it also gives a number of salient features of the large dams in India. SANDRP has been using this document and also been doing some analysis of the information available in the NRLD. As per the latest edition, India has 5187 large dams (height above 15 m in most cases, height of 10-15 m case of some with additional criteria). 371 of these dams are under construction and rest have been completed. In case of 194 large dams in NRLD, we do not know the year of construction, which means most of such dams must have been built before independence. NRLD follows the definition of large dams given by the International Commission on Large Dams for inclusion of dams in the NRLD. However, the NRLD is far from exhaustive list of large dams in India. Very significant number of large dams built for hydropower projects in Himachal Pradesh, Uttarakhand, North East India, among other states, do not figure in the list, even though all of these would come under the definition of large dams as given in the NRLD. To illustrate from Himachal Pradesh, following dams are all under construction as per Central Electricity Authority, many of them in advance stages, but they do not figure in NRLD: Allain Duhangan, Kashang, Sainj, Swara Kuddu, Shongtong Karcham, Sorang, Tangnu Romai, Tidong. It’s a dangerous situation for safety issues, since many of them are under construction by private companies. 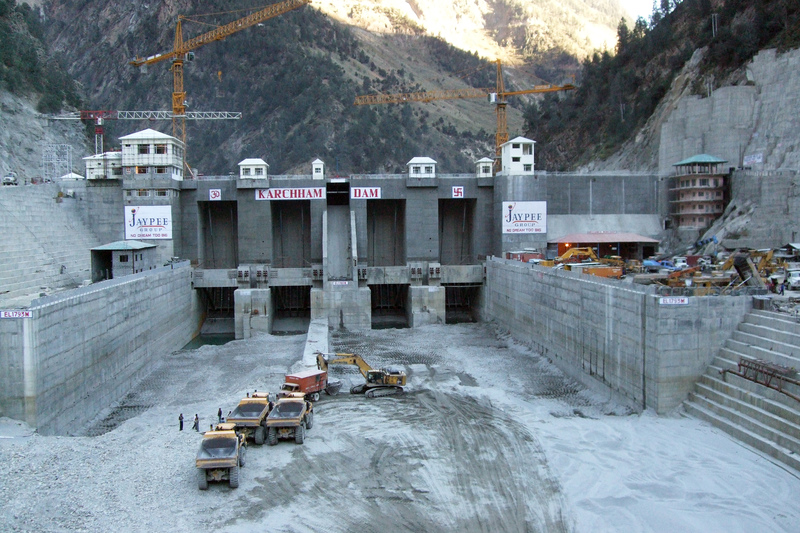 For example, in December 2012 heavy leakage was detected in the surge shaft of the 1000 MW Karcham Wangtoo Project on Sutlej River in Kinnaur district in Himachal Pradesh. The project had to be shut down and the repairs are still going on. Had there been a serious mishap at the project the impact would be also felt by the cascade of projects downstream, including the 1500 MW Nathpa Jakhri HEP (India’s largest operating hydropower project), 412 MW Rampur HEP, 800 MW Kol Dam HEP and the Bhakra complex further downstream. Earlier in 2010 and 2011 we filed a number of applications with the CWC under the Right to Information Act to ask them how a very large number of dams that were listed in earlier NRLD of 1990, 2002 (both printed versions) did not figure in the NRLD 2009 and many of the large dams listed in 1990 also did not figure in NRLD 2002. The CWC response in most cases was to transfer our RTI application to the relevant states, stating that CWC is not responsible for the information in the NRLD, it only compiles the information given by the respective states. This was far from satisfactory response from India’s premier technical water resources organisation. Was CWC acting only as a post box on even such a serious issue of listing of large dams? It was not applying its mind to the information supplied by the states, not raising any questions, nor clarifying the contradictions and gaps with respect to the earlier editions of NRLD? Needless to add, this reflects very poorly on the CWC. Here it should be added that CWC is also responsible for the monitoring policies and practices related to the safety of dams in India as also a number of other aspects. What kind of diligence can we expect from CWC under these circumstances? Our analysis then also showed that many dams that should have figured in the earlier versions (considering the date of completion stated in the subsequent editions of NRLD) were not there. Again our RTI applications in such cases were transferred to respective states. We did get some response from Central Water Commission and Maharashtra, which was far from satisfactory. In case of over a hundred dams, the CWC Director, Design and Research Coordination Directorate accepted the errors in NRLD and promised that “Data entry errors/ omissions as indicated above will be rectified”. Where are our dams located? A quick review of the latest NRLD raises some fresh questions of the NRLD. In this exercise we just wanted to check how many dams are there in different river basins/ sub basins. This is an important question from a number of perspectives including cumulative impacts, optimisation of dam operations, hydrological carrying capacity and cumulative dam safety issues, to name a few. We through this would be simple enough exercise. But when we started looking at the 5187 large dams of India listed in NRLD, we found that in most cases, there is no name for the river on which the dam is constructed. When counted, we were shocked that in case of 2687 or 51.8% of large dams of India, the NRLD does not mention the name of the river. In most cases they just write “local river” or “local Nallah” or the box under river is left blank. Under the circumstances, it is not possible to get a clear picture of any river basin, nor about the cumulative impacts or safety aspects or possibility of optimisation of the dams in any one river basin. The absence of such basic information reflects very poorly on the quality of NRLD, and on the CWC and respective states. India’s largest dam builder state, namely Maharashtra, has the largest number of dams for which it does not know the name or location of the rivers or tributaries. Out of 1845 large dams in Maharashtra, in case of 1243 dams, Maharashtra does not know the name of the rivers! That means in case of 67.37% of its dams, Maharashtra does not even know the names of the rivers. It is not just for the old dams, but even for 81 of the dams completed after 2000, Maharashtra does not know the names of the rivers. Even for relatively larger 61.19 m high Berdewadi dam (completed in 2001) and 48 m high Tarandale dam (completed in 2007), the names of the rivers are now known. Madhya Pradesh is worse than Maharashtra, it does not know the names of the rivers for 90.17% of its dams (817 dams out of total of 906). In percentage terms, Chhattisgarh is worst as it does not know names of the rivers for 227 of its 259 large dams. These three states of Maharashtra, Madhya Pradesh and Chhattisgarh collectively do not know the names of the rivers for 2287 of dams in NRLD. Some of the other states that should also share the “honours” here are Gujarat (138 dams out of 666 for which names of rivers are not known), Andhra Pradesh (124 out of total of 337) and Rajasthan (71 out of 211 large dams). It is a disturbing situation that the agencies that are responsible for our large dams do not even know the names of the rivers (every river in India has a name, so if someone were to argue that the rivers do not have names, it won’t be acceptable excuse) on which they are located. Without the names of the rivers and locations of the various dams on specific rivers, we cannot even start looking at the crucial issues like dam safety, cumulative social and environmental impacts, hydrological carrying capacity and optimum utilisation of the storages created behind the dams. We clearly have far to go to even start knowing our dams and rivers.